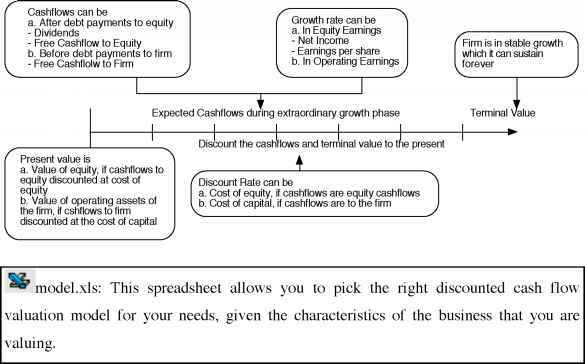 All discounted cash flow models ultimately boil down to estimating four inputs -current cashflows, an expected growth rate in these cashflows, a point in time when the firm will be growing a rate it can sustain forever and a discount rate to use in discounting these cashflows. In this section, we will examine the choices available in terms of each of these inputs. In terms of cashflows, there are three choices - dividends or free cashflows to equity for equity valuation models, and free cashflows to the firm for firm valuation models. 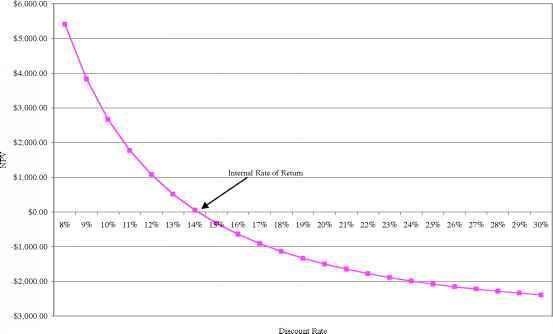 Discounting dividends usually provides the most conservative estimate of value for the equity in any firm, since most firms pay less in dividends than they can afford to. In the dividend policy section, we noted that the free cash flow to equity, i.e., the cash flow left over after meeting all investment needs and making debt payments, is the amount that a firm can pay in dividends. The value of equity, based upon the free cash flow to equity, will therefore yield a more realistic estimate of value for equity, especially in the context of a takeover. Even if a firm is not the target of a takeover, it can be argued that the value of equity has to reflect the possibility of a takeover, and hence the expected free cash flows to equity. The choice between free cash flows to equity and free cash flows to the firm is really a choice between equity and firm valuation. Done consistently, both approaches should yield the same values for the equity in a business. As a practical concern, however, cash flows to equity are after net debt issues or payments and become much more difficult to estimate when financial leverage is changing over time, whereas cashflows to the firm are pre-debt cash flows and are unaffected by changes in the leverage. Ease of use dictates that firm valuation will be more straightforward under this scenario. The choice of discount rates will be dictated by the choice in cash flows. If the cash flow that is being discounted is dividends or free cash flows to equity, the appropriate discount rate is the cost of equity. 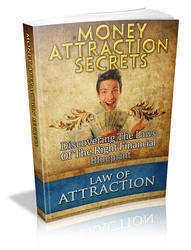 If the cash flow being discounted is the cash flow to the firm, the discount rate has to be the cost of capital. 1. How long in the future will a company be able to grow at a rate higher than the stable growth rate? 2. How high will the growth rate be during the high growth period and what pattern will it follow? 3. What will happen to the firm's fundamentals (risk, cash flow patterns etc.) as the expected growth rate changes? 1 We should generally become much more conservative in our growth estimates as we move up the income statements. Generally, growth in earnings per share will be lower than the growth in net income, and growth in net income will be lower than the growth in operating income. choices are summarized in Figure 12.1. We will now examine each of these valuation models in more detail in the next section.